Two of the more hoped-for heavy-hitters of the holiday season arrive this weekend as the big films of December start jockeying for position for the Christmas bonanza. This week, star power comes out to play, and a fantasy franchise looks to restart its momentum. In 2005, The Lion, The Witch and The Wardrobe, the first of the films based on the Chronicles of Narnia, hit theaters, and put up Harry Potter/Lord of the Rings numbers, putting dollar signs in the eyes of Walden Media, who loved the idea of having six more of these films to make (though I maintain that A Boy and His Horse is largely unfilmable). Not quite understanding the meaning of the word “momentum,” it took three years for the second film (it feels wrong, somehow, to call it a sequel), Prince Caspian, to come out, which started strong but wound up with box office more like a Madagascar film, which is nothing to sneeze at, but then these are tremendously expensive films to make. It's with those lowered expectations that The Voyage of the Dawn Treader enters into the fray. 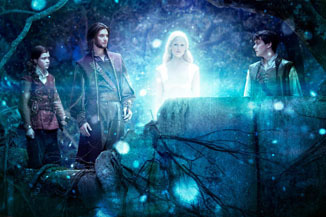 An episodic nautical adventure, it reunites the Pevensie children with the now King Caspian on a mission to rescue seven swords of something or other. Point is, there's a boat and monsters and they fight and lessons are learned. Five years later, it's clear that the heat from TLTW&TW won't be there for Dawn Treader, though the Narnia name still carries weight. A move to 3D and a sort of Pirates of the Caribbean adventure plot that's been glommed onto the story should help, however. It's kind of fuzzy, and a lack of clear idea about what it's about will keep it from being bigger or improving on the opening weekend for the series, but the action in the trailers and commercials looks solid. Reviews are quite weak, though, and may cause some shedding of the fanbase from Caspian, which opened to $55 million. The main cast continues to be the largely anonymous group of British ragamuffins from the first two films, along with Liam Neeson as Aslan and Tilda Swinton as The White Witch. Directed by Michael Apted and opening at over 3,500 venues, The Voyage of the Dawn Treader should start with about $43 million. While Dawn Treader handles family audiences, more adult fare heads towards The Tourist, an international thriller starring Angelina Jolie and Johnny Depp. A remake of a French film, Jolie stars as a thief who seduces Depp into a complicated heist plot based on his apparent resemblance to another thief and twisty-turny plot moments abound.